I crave sweets all. The. TIME. Always. Not kidding. You could wake me up in the middle of the night and stick a doughnut in my face, and I wouldn’t turn it down. “Huh? What is this?” I woud say groggily, at least one of my eyes still closed. “Oh. A doughnut? Yea ok, gimme.” And then I would roll over. But my boyfriend? He doesn’t have that same passion for sweets. He’s one of those people that is content with eating one Oreo. One of those that can actually stop after just a few M&Ms. One of those whose face puckers when he’s had too much ice cream or pie or frosting or sugar in general. But if there’s one sweet treat I can count on to make his eyes sparkle, it’s sachertorte. (I know, right? Sachertorte. Way to be difficult… and European.) Sachertorte, FYI, is a Viennese chocolate cake layered with apricot jelly, and annoyingly enough, not found as easily as say, red velvet cake or fudge brownies. While it’s not my absolute favorite dessert, it wasn’t bad. It could have used a little more apricot jam between the layers of chocolate cake, and the cake itself could have been a touch more moist. 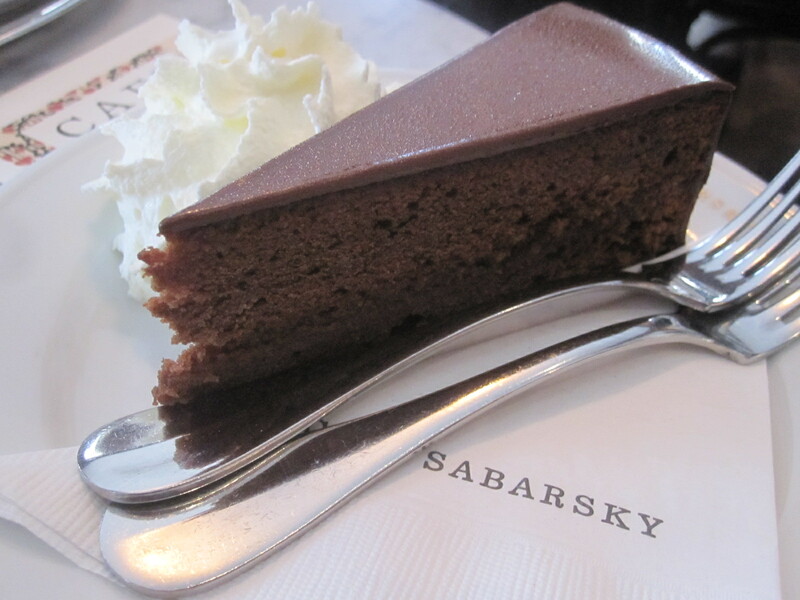 Like Cafe Sabarsky, this sachertorte was nice but felt a little too serious, a bit too uptight for my taste. But it made Flaneur happy and that was sweet enough for me. This entry was posted in Sweet stuff and tagged apricot, Cafe Sabarsky, chocolate, Neue Galerie, Sachertorte, Upper East Side. Bookmark the permalink.